My first time email blogging is a burger review! Had some extra time after work before attending an author event at the Free Library (Steven Raichlen!) so I trotted across the very difficult to navigate on foot Ben Franklin Pkwy. Frog Burger's been getting lots of press over it's chub-burger, touristy named "Love Burger" which features TWO grilled cheese sandwiches for buns! I can rarely resist but here I did and got a standard cheddar cheese burger. They didn't ask for a temp but mine came out a juicy medium. Acceptable for a place I'm not good friends with yet. 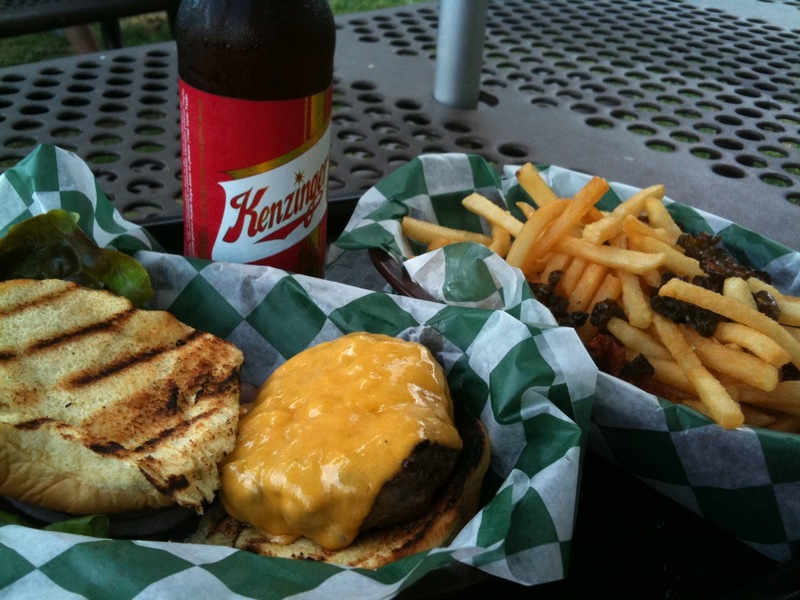 I also had jalapeño fries and a Kenzinger Ale from Philadelphia Brewing Co ($2 @ happy hour!). It was well executed. For a gourmet burger stand I want more than a potato roll fresh from a bag for a bun, even though it was grilled. Nor am I a fan of the almost shoe-string cut of the fries. Yet what it comes down to is this : Is it the best burger on the Parkway? YES. Is it destination burger worthy? NO. What I wonder is, how did they get the license to do this? I know a little too much about opening a business in this neighborhood and it ain't easy! Outdoors and serving alcohol? Who did they blow? Service was great, BTW.